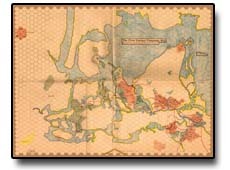 Click of the map to the side for a downloadable map for printing on a 8x11 sheet at 300 dpi. More source material and a new retooled map coming soon! The Original Campaign Books by once published by TSR, Copywrite by Dave Arneson, all rights reserved. Download is for personal use only and no rights given. Orignally It was the campaign Dave created and had for all his role-playing games that evolved into what we know as D&D. This world then was ready to publish and was to help launch the new era. But the new preisdent of TSR just finished creating his own world and in fashion the company published his works first. You can see the dates inside the cover point out Blackmoor was first even in the Copyrights. Greyhawk was produced later despite the lable Supplement 1, and Blackmoor with its earlier date points out that it really is Supplement 1. More information coming on examples and proofs. 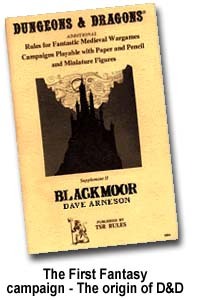 Click on Blackmoor campaign book image to download the PDF version of the original books. © 1967-2001 By Dave Arneson, all rights reserved. Dungeons & Dragons is properly owned and copywrtten by TSR inc. who is owned by Wizards of the Coast who is owned by HASBRO. The Name is used in reference only.